djkardkreations: CASology Week #10 ~ The Sky's the Limit! CASology Week #10 ~ The Sky's the Limit! Unlike yesterday's card, today's card was just pure fun and came together just as I'd imagined as I CASE*d one of the design team cards at CASology. This is the tenth week of this challenge blog and the cue word is "sky." "Your card is really outstanding, Tracey! I know the adorable balloon is a focus pocus, but I love the clouds and all that inviting grass! I picture myself laying in it, staring up into the clouds and seeing what imaginary shapes they form!!" Thanks, Tracey! That was fun! Little dude or dudette appears to be sleeping, now that I see it on here, but that's okay, too! Nothing like a nap on the grass. I thought you might also enjoy a photo of my beautiful dahlias in full ahhtummmmnal bloom! aahh... your card brings back memories of doing the same thing as a kid, darnell! that aside it also made me chuckle! thanks so much for playing along with CASology each week... you always make me smile! Darnell you are so sweet--hugs to you. Your card does bring back memories of childhood looking up at the clouds and also memories of Kilroy! Fantastic! What a cute Dudette gazing at the sky or sleeping in the grass! I love dahlias and have never tried to grow them. And congratulations on your mention last week (or the week before) at CASology! Should have won! Love it! We've had some amazing cloud formations around recently and although I haven't laid down in the grass, it's fun to imaging and let your mind wander! 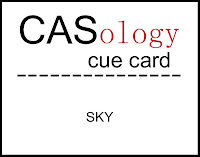 Thanks for playing this week, with your fun and original take on SKY! So many memories. Now I wouldn't want to get down on the ground with the bugs, and it would also mean I have to get up. When did that happen? Sad. I love your card! ZZZzzzzzzz Just joining your little man there staring at the clouds! Brilliant! Love your dahlias! I've been viewing your blog all week but haven't had time to really read. Today is the beginning of a long weekend and I need a break before it even starts - so...here I am!! Ready to read and enjoy. Now I'm looking at your dude/dudette wishing I were daydreaming in the grass. Here's the sad part - I'm so not ready for my weekend - my mental perspective is down - and I see that cloud above him as a rain cloud. I guess I need to read a few more of your blog posts to cheer up!! This made me smile, I love it! It must be a dude with eyelashes that long (why do the boys get the longest lashes when they don't need 'em?). Yep I've played that game...clouds are fascinating things, funny how I always end up dreaming of Candy floss tho!! Stunning Darnell, that little person is definitely sleeping and dreaming maybe of having a nose reduction but all the same a fabulous card and it made me smile. So origional and yours is really case worthy too. Darnell, I have to agree with you, I too love this blog and Tracey is just the sweetest person ever! 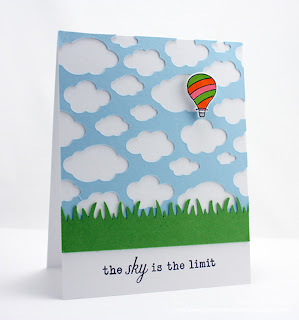 Your card is just so sweet, love the cartoon face looking up at the clouds, so much fun. Oh, Darnell, this is so creative and fun ~ I still like to lay on the grass and look up at the clouds. It's just harder to get up now! Hope your back is starting to feel better!